The stock market has so far put in a spectacular bull run for January 2013, which has surprised both bulls and bears as all of the major stock market indices set new bull market highs, including the index which I track and trade, the Dow Jones Industrial Averages which is now within touching distance of 14,000. Meanwhile delusional bears right across the globe can literally be seen foaming at the mouths as illustrated by the diatribe that continues spew out of commentary of an always imminent bear market, crash, collapse etc... When the reality is as the following charts illustrate that not only have they and everyone who listened to them missed out on what is a stocks bull market that is approaching the END of its FOURTH YEAR ! But that have actively been betting against an exceptionally strong recent bull run that is the exact mirror image of the crash that they have been so furiously proclaiming as always being imminent. The big picture remains as I have iterated countless times over the years (The Inflation Mega-trend Ebook of Jan 2010 (FREE DOWNLOAD), and as illustrated by the below graph that asset prices tend to be LEVERAGED to Inflation, which is precisely the trends that have subsequently transpired from stocks to commodities such as Gold and as I have been flagging during 2012 for the US housing market going into 2013. Note that the Inflation Mega-trend is EXPONENTIAL, and no matter how loudly the delusional deflationistas scream for always imminent DEFLATION, it is just NOT going to happen, if anything government actions i.e. 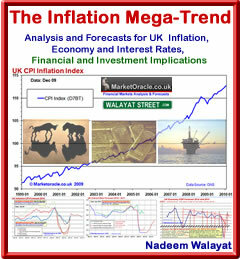 QE-4EVer is going to result in the ratcheting higher of the the Inflation Mega-trend going forward. Frankly, I just do not understand why so many people that purport to be experts on the financial markets can remain so blind to what is blatantly so obvious. The only logical conclusion is that they never put their own money on the line and thus never face the financial consequences (PAIN) for being wrong, for had they followed their advice such as betting against a near 4 year bull market then they would have already bankrupted themselves several times over by now, but instead merrily go around spouting what amounts to nothing more than verbal diarrhoea. The new year bull run has now put the Dow within touching distance of the psychologically important 14,000 level and my long standing target of 14,200 as illustrated by the March 2011 Stocks Stealth Bull Market ebook (FREE DOWNLOAD). However, as subsequently expected the stock market marked time during 2012 as it sought to unwind speculative interest built up during the preceding 3 year bull run which has resulted in the Dow taking much longer than originally expected to home in on my 14.2k target. Therefore my next in-depth analysis will seek to map out an up-to date trend for the Dow for the whole of 2013 and possibly beyond, ensure you are subscribed to my always free newsletter to get this in-depth analysis and detailed trend forecast in your email in box. In the meantime check out my other recent concluding trend forecasts for 2013.